26th October saw the opening of the new park & ride site at Winnersh Triangle, with the vehicles branded the previous day ready to go into service. The official opening took place on the morning of 26th lead councillor John Kaiser, Wokingham Borough Council抯 executive member for planning and highways, Cllr Tony Page, Reading's lead councillor for strategic environment, planning and transport and Martijn Gilbert, Reading Buses' chief executive. 651 at St Mary's Butts on 31st October 2015. The new site is open from 0700-1900 Monday to Saturday, with buses running every 15 minutes as before at Loddon Bridge and around 400 parking spaces available. The site also boasts two electric car chargers, cycle, motorbike and disabled parking, CCTV and automatic number place recognition (ANPR). After the service finishes in the evening, tickets can be used on "the lion" 4/X4 to travel from Central Reading. Passengers can alight at the Cavendish Gardens stop and walk through the railway underpass at Winnersh Triangle Station to access the car park. Like at Mereoak, parking charges are now introduced. 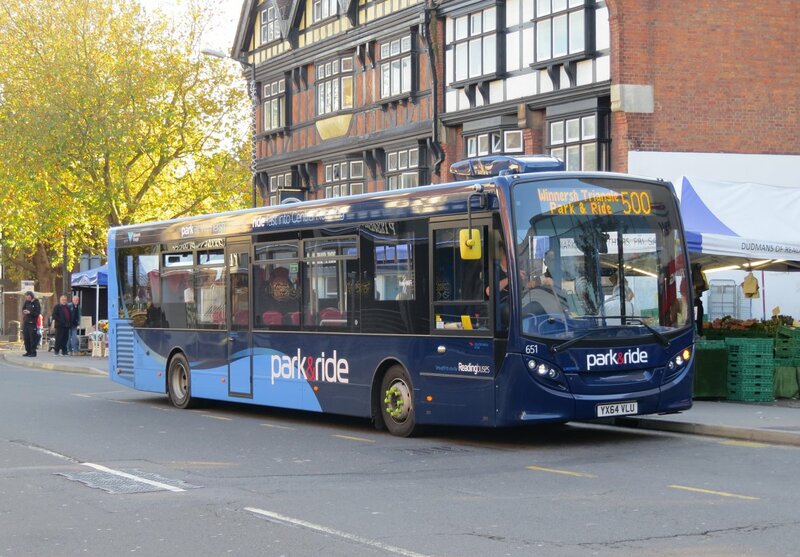 The cost for park and ride parking is included in the bus fare, except for concessionary travellers where a �parking charge per car is paid on the bus. Train passengers and other parkers are charged �for the whole day (10 hours), with discounted season tickets available.